In part 1 of this 4-part series of blog posts, I listed 13 things that science can't explain. Below is a discussion of 12 more things that science cannot explain. Quasars are very energetic astronomical objects associated with the cores of very distant galaxies. Quasars shoot out jets of gas in a particular direction. Scientists know of no reason why these jets of gas should not be pointing in random directions. But surprisingly, what are called the polarization vectors of quasars tend to be aligned in the same direction in particular regions of space. In one gigantic area of space, they may be aligned in one direction, and in another huge region of space, they may be aligned in some different direction. This is an unexplained cosmic anomaly that leaves astrophysicists scratching their heads in bewilderment, as discussed here. Daniel Dunglas Home (1833-1886) was a 19th century man with a seemingly unparalleled career as a worker of paranormal wonders. He traveled around for many years working wonders in many different houses of the upper class. Many very distinguished witnesses reported that he could do an astonishing array of marvels. These included feats such as elongation (making his body longer); making an entire room shake; playing musical instruments without touching them; picking up hot coals and holding them for some time without damaging his hands; and also the levitation of heavy tables and his own body. In one famous incident, it was reported by 3 distinguished witnesses (including the earl of Dunraven, Lord Adare) that Home had levitated, floated out of a window, and floated back in another window. A very distinguished scientist (Sir William Crookes) investigated Home and reported that several of his paranormal wonders were genuine. Home was never found guilty of fraud. No explanation is offered by scientists to account for these facts. From an evolutionary standpoint, the existence of homosexuality is a great puzzle. It is believed that homosexuality is something inherent, not a choice. So from a Darwinian standpoint, homosexuality must be due to some genetic factors. But if such genetic factors existed, they should have become less and less prevalent as time passed. This is because evolution tends to work very efficiently to increase the prevalence of anything that causes additional reproduction, and it also tends to work very efficiently to decrease the prevalence of anything that causes less reproduction. So from a Darwinian standpoint, the large-scale existence of homosexuality is basically inexplicable. Scientists have made some attempts to explain the existence of homosexuality, but none of them are convincing. Acupuncture is a traditional Chinese medical technique involving sticking needles in the body. It has a long history of being medically successful in relieving pain and alleviating symptoms, but scientists have basically no idea as to why it should work. Quantum entanglement is a baffling phenomenon in which a change in the state of one set of particles seems, in effect, to instantly produce a similar (or opposite) effect in another set of particles, even though the two sets of particles may be very far away. Quantum entanglement is sometimes called “spooky action at a distance.” Scientists have no explanation as to why particles should act in such a coordinated way. Scientists say that the vacuum of empty space should be seething with energy, as what are called virtual particles pop into existence and pop out of existence. Calculations based on quantum field theory lead to the conclusion that ordinary space should have an energy density so great that each cubic centimeter of space should have many times more mass-energy than the mass-energy in a cubic centimeter of solid steel. But for some reason the vacuum of empty space is many, many trillions of times less dense than predicted by quantum field theory. Scientists have no explanation for this, which is one of the great outstanding puzzles of modern physics, as discussed here. Models of solar evolution lead scientists to conclude that the sun should have given off much less heat billions of years ago. In fact, a straightforward calculation leads to the conclusion that our planet should have been entirely frozen until about 1.7 billion years ago. But scientists think that life is more than a billion years older than that. How could life have begun if the planet was apparently too cold for that to have happened? Scientists have no good explanation, as discussed here. For more than a decade the United States government funded research on remote viewing, which is allegedly the ability of some people to be able to kind of “send out their minds” to get information about remote locations. Despite many successful trials, the program was finally canceled. To explain remote viewing, we would need either an explanation of why it exists, or an explanation of why positive results might have so often been reported if it does not exist. Science offers neither of these explanations. In modern physics there is a “naturalness” problem regarding the Higgs field, a very important all-pervasive field that helps determine the mass of fundamental particles. The problem is discussed here. The problem is basically that we should not at all expect the Higgs field to have the low value that it has, but some other value more than a billion times larger. Science currently has no good explanation for this anomaly. There is an incredibly ornate attempt to explain it away through a theory called supersymmetry, but recent experimental results at the Large Hadron Collider have almost ruled out that theory. Our existence depends on an exact numerical coincidence in nature: the coincidence that all protons have a particular electrical charge of 1.6021765 X 10-19 coulomb, which is exactly and precisely the opposite of the electrical charge of each electron (-1.6021765 X 10-19 coulomb). If this coincidence did not happen to exist, stars and planets would not be able to hold together, and we wouldn't be here. Now this coincidence would not be too surprising if all protons had the same mass as each electron. Then we could simply say, “Protons and electrons have the same mass, so it's not too surprising that their charges are the same.” But in reality, each proton is 1836 times more massive than each electron. So the fact that the charge of the proton is the exact opposite of the charge of the electron is something in need of explanation. But modern physics offers no explanation for this coincidence. The Global Consciousness Project is a long-running project that uses a worldwide network of continually running random number generators. The project correlates the output from these random number generators with notable world events. The project concludes that there is a very significant deviation between the results of the random number generators (during notable world events) and the output that would be expected by chance. The cumulative deviation from chance is growing larger and larger as time passes. The project estimates the likelihood of the total deviation from chance is about 1 in 3,000,000,000,000. Science has no explanation for this anomaly. According to the standard scientific story, your consciousness is produced entirely by your brain. But there are some strange anomalies that seem hard to explain if that is the case. As discussed here, there are documented cases of people who functioned very well even though they had lost half or more of their brains. Science has no explanation for such anomalies, other than the vague word “plasticity,” which doesn't really explain anything. Science is a good and great thing, and it is very good at explaining quite a few things, such as the production of energy by the sun, the appearance of volcanoes and tsunamis, and the details of biological reproduction. Some like to think that science has an explanation for almost everything. But this is far from the truth. In reality, there are many things that science has no credible explanation for. In this four-part series of blog posts, I will list 50 such things. Scientists say the universe began in an incredibly hot and dense state (supposedly an infinitely dense singularity). But they have no explanation at all for what may have caused this event. The only attempts to explain this event have been purely speculative. Scientists say the Big Bang should have produced equal amounts of matter and antimatter. When a matter particle comes into contact with an antimatter particle, both are converted into pure energy (photons). Scientists say that given the incredible density at the Big Bang, all of the universe's matter particles should have combined with antimatter particles, leaving a universe with nothing but energy. But instead we have a universe in which there is lots of matter, but no detectable antimatter. Scientists call this puzzle the mystery of matter/antimatter asymmetry. Scientists have been scratching their heads over this issue for decades, but don't seem to be getting anywhere in solving it. As discussed in this post, very strong evidence has been gathered over more than 80 years for the existence of extrasensory perception. Much of this evidence has been gathered under carefully controlled scientific conditions that meet all the standards of modern experimental science. Science offers no explanation for why the human mind should have such an ability. Many a modern scientist prefers to simply deny that there is any evidence for the phenomenon, despite the accumulation of a mountain of evidence for its existence, both laboratory evidence and quite common anecdotal evidence. Scientists say that the first life consisted of self-replicating molecules simpler than cells. But scientists have no explanation for the origin of the first self-replicating molecules. Scientists have been trying for decades to figure out how simpler chemical compounds could have developed into self-replicating molecules, but have made little progress on this matter. Part of the problem is that the main way of explaining the development of complexity is biological evolution. But before there were self-replicating molecules, there could have been no biological evolution. So biological evolution can't explain the origin of the first self-replicating molecules. In order for life to begin, you need not merely self-replicating molecules, but the genetic code, which is kind of a simple language used in the production of proteins. The origin of this genetic code is an unexplained mystery. Although skeptics may say that ghost sightings are a relic of the past, all available evidence is that apparition sightings are not any less frequent now than in the past. There is evidence that a significant fraction of humanity may have experienced an apparition sighting or a similar experience. What does modern science have to say about this phenomenon? Virtually nothing. There is no prevailing theory to explain away such sightings. The simplest natural explanation – hallucinations – is not credible, because apparitions seem to be experienced by such a significant fraction of the population, most of whom have no psychiatric symptoms. Nor can one plausibly explain apparitions as hallucinations caused by fear, as there is no evidence that fear produces hallucinations; and apparitions often are reported as sudden appearances by people who are not afraid. Here is another way to consider the mystery of the origin of consciousness. Let us define a philosophical zombie (for lack of a better term) as a person who acts like a human but has no real inner consciousness or self or private thoughts or inner emotions. We can imagine a race of such beings existing on our planet rather than human beings. Biologically, such a race seems every bit as plausible to exist as the human race (or even more so, since less is required from the brain). So why doesn't such a race exist rather than our race? Science has no answer. It would seem that we cannot have the slightest hope that science will ever be able to solve this problem. We cannot hope that science might discover something such as some natural law that guarantees the existence of something, because such a natural law would itself be something in need of explanation; and we could always ask why was there not any such natural law, and not anything else? For decades people who came close to death have been reporting amazing experiences involving things such as seeming to float out of their bodies, traveling through some mysterious tunnel, encountering a Being of light, and encountering dead relatives. Quite a few examples can be found here. Science has no good explanation for this phenomenon. We cannot plausibly explain near-death experiences by assuming oxygen deprivation, because we have plenty of accounts of pilots and mountain climbers who experienced oxygen deprivation, and the effects reported do not strongly resemble those of near death experiences. We also cannot explain near-death experiences as being the result of drugs, as no known drug given to dying people produces similar accounts, and the accounts often occur when people have not recently been given drugs. This article yesterday gave a good overview of the work of a scientist who has done computer simulations to help answer the question: how big a change in some fundamental physical constants (the quark masses and what is called the fine structure constant) would mess things up so that the universe wouldn't have abundant amounts of carbon and oxygen (both requirements for living things)? The scientist came up with an answer of about 2 percent. It seems that our universe is fine-tuned so that it has two of the prerequisites of living things, abundant amounts of carbon and oxygen. Scientists have no explanation for this example of cosmic fine-tuning. I am not counting the idea of a multiverse (the possibility of some huge collection of universes) as an explanation. Since we have no verified example of anything ever being explained by the assumption of a huge collection of universes, a multiverse explanation is disreputable. Because it is unverifiable, the idea of a vast set of other universes is not really a scientific explanation, but a metaphysical type of claim. Also, we wouldn't explain fine-tuning in this universe by assuming the existence of many other universes, because the existence of such other universes would not make it any more likely that this particular universe would have the characteristics needed for life. Table tipping was hugely popular during some years in the nineteenth century. A group of people would often get together, lay their hands gently on a table, and find after a while that the table would start moving about or tilting. Spiritualists said this was evidence of intervention by spirits of the dead, although an alternate paranormal explanation is that somehow a group of people acting together can produce a small psychokinetic “mind over matter” effect. Skeptics may say that table tipping is no longer observed, but that's not correct. On www.youtube.com if you search for “table tipping” you can find 17,000 videos, some of which are very spectacular. Science has no real explanation for the more dramatic cases of table tipping. There is a theory that something called the “ideomoter effect” causes people to subconsciously move tables while having their finger tips on top of them. But while such a theory might account for a little bit of movement of a very light table, such a theory cannot explain the more dramatic cases of table tipping shown on www.youtube.com, which show tables (sometimes heavy ones) dramatically moving about when people simply lightly lay their finger tips on top of them. There are two great marvels to appreciate in the fact that we look out and see so many spiral galaxies in the universe. The first marvel is that any spiral galaxies should even have formed after the Big Bang. One would expect that an inconceivably violent explosive event such as the Big Bang should have produced only the wreckage of a universe, not a universe in which beautiful and orderly spiral galaxies are abundant. Scientists know that certain parameters such as the gravitational constant had to be just right for galaxies to have formed. The other great marvel involving these spiral galaxies is that they have continued to exist for billions of years. 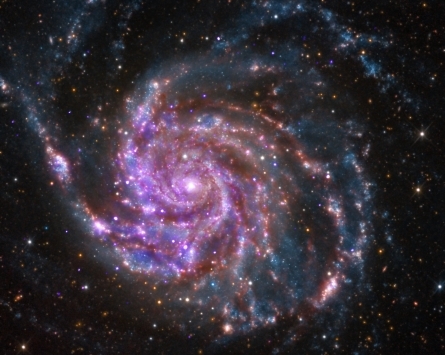 There is an unsolved problem called the winding problem, which is that the rotation of spiral galaxies should cause them to lose their spiral shape after only a few rotations, which would occur in about 600 million years. But somehow spiral galaxies have persisted for a period more than 10 times longer, for more than 10 billion years. There is currently no adequate scientific explanation for this. Reports of astonishing UFOs in the sky have continued for more than 50 years, and there are many dramatic photos and videos to substantiate the phenomenon. Does science offer any natural explanation? It can only explain the less dramatic cases. Explanations such as “seeing Venus” or “swamp gas” or “reflections in the windshield” cannot explain very bright UFOs seen outside of a car far away from a swamp. But what about the simple explanation that UFOs really are alien spacecraft from another planet? Isn't that a good scientific explanation for UFO's? But the problem is that it is often reported that UFOs accelerated at enormous speeds that would kill any life forms in them. Also, if UFOs are from some other planet, how come astronomers cannot seem to detect any extraterrestrial “mother ship” out in outer space? So we must also put down UFO's as something science cannot currently explain. In my next post on this blog, I will describe 12 or 13 additional things science cannot explain; and by the time the 4-part series is over, 50 such items will be listed. The plume had a diameter of 600 miles, and reached a height of 120 miles. It persisted for about 10 days. Below is a photo from the Nature paper. The chart shows the height, in hundreds of kilometers. An “ice cloud.” In the Nature paper, scientists calculated whether the plume can be explained as an ice cloud. They concluded that the temperature in the Martian atmosphere would need to be more than 100 degrees colder than expected for such a cloud to have formed. Also, ice crystals have never been observed to rise more than 60 miles in the Martian atmosphere, only half the height of the mysterious plume. A dust cloud. Summarizing the findings of the Nature paper, Time magazine says “the reflectivity was all wrong” for a dust cloud explanation. Furthermore, in order for such a huge plume to have arisen, there would have had to have been a huge dust storm on the surface of Mars in March 2012, and no such storm was observed. Previously observed dust clouds never rose higher than 37 miles – less than a third of the height of the gigantic Martian plume. An aurora. An aurora is a cloud of charged particles from the sun, one that interacts near a planet because of the planet's magnetic field. But the magnetic field of Mars is much less than Earth's, meaning auroras are smaller and less frequent. To explain the dramatic plume as an aurora, there would need to have been some huge surge in the solar wind that produces the particles in an aurora. Such surges sometimes occur, but as the Nature paper points out, no such surge in solar activity occurred in March of 2012. The Nature paper also says an aurora model “falls short of the reported plume brightness by orders of magnitude.” The phrase “orders of magnitude” means a factor of at least 100. In short, the Mars plume seems to have been way too bright to have been an aurora. In short, scientists have no suitable explanation for the mysterious Mars plume. We can therefore call the plume “preternatural,” which is a neutral term meaning “resembling something paranormal or supernatural.” We may therefore allow ourselves to consider some unusual possible explanations entirely different from the ones previously listed. I do not claim that any of these is likely to be true, but they are at least interesting to consider. Possibility 1: Evidence of aliens tinkering around Mars. Whenever you raise the possibility of intelligent extraterrestrial activity on Mars, skeptics say something along the lines of: “Don't be ridiculous –conditions on Mars are too harsh for intelligent life to have evolved there.” But this argument is not convincing. Extraterrestrials may have come to Mars from some other solar system. It could be that the Mars plume is somehow the result of activity by visitors from some other solar system. Perhaps they were building some underground base, and raised a huge cloud of dust during construction. Or perhaps they are testing out some huge cloud to be used in a gaseous attack on our planet – similar to the gas attacks imagined by H.G. Wells in The War of the Worlds. Possibility 2: Vaporous life-forms hanging around Mars. Whenever we think of extraterrestrial life, we tend to think of either beings that are flesh-and-blood like us, or beings that are robotic. But some extraterrestrials might be neither of these. They might be cloud-like entities that drift around like the gas clouds that drift through deep space. To read more about such a possibility, read my previous blog post Mind Mist: The Possibility of Gaseous Extraterrestrial Intelligence. It could be that the strange plume on Mars was either a single huge gaseous intelligence or perhaps a kind of gaseous intelligence that is a “group mind” made of a swarm of smaller entities. Possibility 3: A sign from some mysterious superhuman intelligence, extraterrestrial, spiritual, or “other dimensional.” There is substantial evidence to suggest that some non-human intelligence may be signaling its existence to mankind, through manifestations that include a series of strange phenomena. Such phenomena may include crop circles, strange objects on the surface of Mars, UFO's and orbs. (See this site for some very dramatic newly released orb photographs that are extremely difficult to explain away.) Perhaps the gigantic Mars plume is just another sign of this type – a manifestation left by some unknown superhuman intelligence that is trying to attract our attention through various "signs and wonders." When the US president announced that a giant asteroid was heading towards a collision with planet Earth, he first tried to make it look like a problem that the government could solve. People were told that NASA would launch a space mission to divert the asteroid from its course, using nuclear weapons to blast the giant space rock off its course. But insiders knew that the chance of success was slim. The asteroid had been discovered too recently, and there wasn't the time needed to properly prepare a space mission with a high chance of success. NASA workers frantically scrambled to put together the crucial launch. They loaded as many nuclear weapons as they could into the payload of a huge rocket. But in the rush, they crammed too much weight into the overloaded payload. When the rocket blasted off, a large fraction of the world watched breathlessly on their TV screens. But after rising a few hundred meters into the air, the overloaded rocket veered to the right, and began spinning in the air. It crashed to the ground in a horrific explosion that spewed lethal plutonium over many square miles. Now it was clear to all: there was no hope of an eleventh hour mission to stop the asteroid. 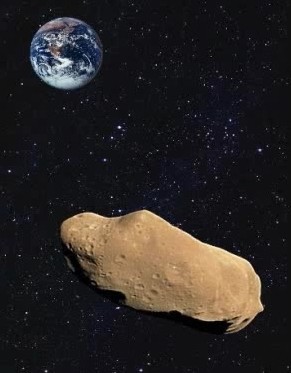 The giant space rock would hit the planet with all its force. Scientists calculated that the asteroid would blast out so much matter on its impact that a large fraction of the planet would be covered with dust. The dust would stay up in the atmosphere for years, blocking out sunlight, and throwing the world into a nuclear winter in which it would be impossible to grow crops. The eventual result would be a mass starvation in which almost everyone would die. The chance of the human race surviving was slim. Scientists announced the exact day and time when the giant asteroid would strike: on December 6th at 11:24 AM. When December arrived, the people of the world dealt with the situation in a variety of ways. In New York City, Priscilla Carlson heard that the glamorous shops on Fifth Avenue had been abandoned, as millions fled the city, seeking higher ground in case of an asteroid collision in the ocean. Priscilla got a baseball bat and smashed open the windows of some chic designer boutiques. She grabbed some status-symbol luxury items such as Gucci handbags and Oscar de la Renta dresses. Returning home, she took pictures of herself with her stolen loot. But after posting the pictures on Facebook, she was heartbroken when her pictures received no “Like” votes at all. Finally she realized how distracted her group of Facebook friends must have been. In Chicago, young Allan Ramsay figured that the worldwide chaos and approaching doom was a golden opportunity for him to do what he always wanted to do: to ride his skateboard on the ledge of a skyscraper. Allan thought that his many daredevil stunts on the streets of Chicago would prepare him for this great challenge. Given the nationwide chaos, he was easily able to get to the 40th floor of a skyscraper. He got the thrill of a lifetime when skateboarding along a narrow skyscraper ledge. But then he ran out of ledge while skateboarding too fast. The poor young lad then plunged to his death. In Florida, William Anderson thought how he would spend his last hours with his two young children. He decided to tell them nothing about the approaching apocalypse. He took the kids out of school, and disconnected his television set, telling his kids to speak to no one for the next week. William decided that on the morning of December 6th, he would spend his last hours doing what he had loved doing more than anything else: reading aloud to his young children, and playing baseball with them in their backyard. On December 5th, the New York Times published what it believed would be its last issue. It had a 6-inch tall headline with a single word: DOOM! On the night of December 5th, people around the world could see the giant asteroid as a bright star in the sky. Then suddenly the asteroid simply disappeared. People all over the world witnessed it. They were looking at a bright star, and then suddenly there was nothing to see. Television shows at first reported that they were having trouble getting a fix on the exact location of the asteroid. But before long it became clear – there simply was no more asteroid. Inexplicably, it had just plain vanished. The world had been spared. Two weeks later, scientist Hubert Keller was interviewed about the amazing incident by a reporter from CNN. “What do you think was the reason why the asteroid mysteriously vanished?” asked the reporter. “So what is your theory?” asked the reporter. “So you don't think the sudden disappearance of the giant asteroid is anything that should make you think that perhaps you've overlooked something, that perhaps there's something more at work in the universe than just blind, accidental causes?” asked the reporter. “Why, of course not,” said the Professor indignantly. Effects that we see in our galaxy must be either the result of ordinary matter or some unknown type of matter (dark matter). There is some stuff going on in our galaxy that is hard to explain by assuming it is just the effects of ordinary matter. Therefore, dark matter must exist in our galaxy. I don't find this reasoning to be convincing. One reason is that there are several other possibilities other than dark matter to explain such observations. One possibility is a dark force. We understand four fundamental forces that act on matter, but there is no reason to assume that we have discovered all of the forces that may exist between material forces. There may be undiscovered physical forces acting between known types of material particles. We may call such unknown, mysterious forces dark forces. This idea has nothing to do with “the dark side of the Force” discussed in the Star Wars movies. Scientists have considered the possibility of such dark forces, but don't seem to like the idea. When I use this link to search for physics papers with “dark force” in the title, I get only 62 papers. But when I use the same site to search for papers with “dark matter” in the title, I am told that I have reached the search limit of 1000 papers. Clearly scientists are much, more comfortable with the idea of dark matter than the idea of dark forces. Why might that be? I think it is related to the fact that scientists like to pretend that they understand all the basic forces at work in the universe (even though such confidence is unjustified). If scientists start talking about a dark force, it will be an admission that they don't really understand the mysterious influences at play in our baffling universe. There is one reason why we should not assume that some unexplained behavior of matter is caused by the influence of dark matter. Besides the possibility of dark forces, there is also the possibility of various undiscovered types of dark energy. When scientists think of dark energy, they think of something that is the same throughout the universe. But that's just one type of dark energy. For all we know, there could be 10 different types of dark energy at play in the universe. Some of those types could appear in greater concentrations in particular parts of the universe. So almost any observation that can be explained as being the result of dark matter can also be the result of an undiscovered dark force or some undiscovered type of dark energy. Is there any real substance behind this idea of dark matter? Apparently not. The very successful Standard Model of Physics says not one single thing about dark matter. It seems that dark matter is basically a kind of euphemism, a fancy way of saying, “Some sort of something,” a verbal way of dressing up a vaporous question mark. Every time that a scientist refers to dark matter, he could just as accurately use the term “Unknown Influence, Possibly Material (UIPM).” That would be a more candid phrase. But the term “dark matter” sounds better. It makes it sound as if scientists have latched on to something substantial, even when they have nothing more substantial in their hands than a person trying to catch moonbeams. 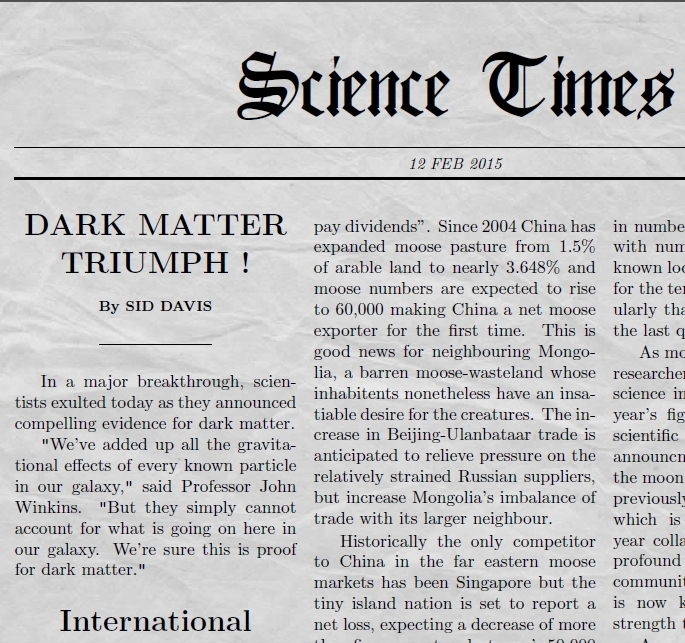 I will illustrate this point by showing some hypothetical newspaper headlines that show how well the term “dark matter” works at helping cosmologists feel better. 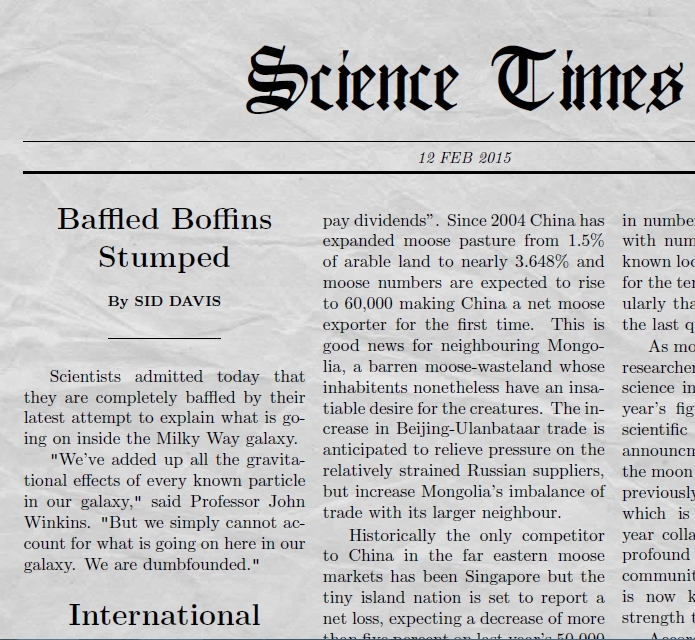 The first headline is a candid headline that could have been produced after the recent survey trying to account for our galaxy based on known material particles. The second headline discusses the same scientific result. But now it all sounds different. The slick term “dark matter” is used to make it appear that something concrete has been discovered. Thus is a ghostly vapor of a bafflement dressed up in a dark dress, to make it appear substantial. For those readers of this blog who haven't had time to look at my other blog www.orbpro.blogspot.com, I have created a YouTube.com video that gives some highlights from the first two weeks of that blog. The video has the rather dramatic title "Ghostly Paranormal Faces #1." By using the term "ghostly" I am not dogmatically claiming to have photographed something that is a ghost. "Ghostly" merely means "resembling a ghost," or "eerie and mysterious," and such a term is definitely applicable to some of the very strange images captured in this video (all of which I took myself). The video is best viewed with the sound on, to appreciate the gentle ambient music. The Universe is 13.81 billion years old... The uncertainty on this is tiny, at only around 120 million years, meaning that we know the age of the Universe to a 99.1% accuracy! But in this post I will give three reasons why we do not know with any certainty the exact age of the universe, contrary to Siegel's claim. This will not at all be some post designed to get you to think that the universe is about 6000 years old, and I have never used the book of Genesis as a guide when considering the age of the universe. But even without considering any scripture or holy book, it is easy to come up with several good reasons why we cannot have any certainty about how old the universe is. Reason #1: There are very many uncertainties in the very long and complex chain of assumptions used to derive an age of 13 billion years for the universe. Before considering the age of the universe, let's consider something simpler: the age of our planet. By what reasoning do scientists conclude that Earth is 4.5 billion years old? A scientist would answer: earthly rocks have been dated to an age of more than 4 billion years. The assumption that we have correctly figured out the decay rate or half-life of one or more radioactive isotopes used to date the rock. The assumption that this decay rate has not changed in the past. The assumption that we have correctly measured the amount of the radioactive isotope in the rock. The first assumption cannot be justified through any simple argument, because a long and complex chain of reasoning is required to back up any claim that a particular isotope has a particular decay rate. The second assumption is basically just an article of faith. We have no way of knowing whether the decay rate or half-life of isotopes may have changed in the past. The third assumption also involves uncertainties. When scientists measure the amount of radioactive isotopes in a rock, they are usually measuring incredibly small quantities; and such measurements may involve errors. For scientists to be wrong when they claim that a particular rock has been dated to an age of 4 billion years, it's not necessary that all of these assumptions be wrong. It would merely need to be that one of these assumptions be wrong. Since each of these assumptions involve a good deal of uncertainty, we cannot be so certain that a rock supposedly dated to an age of 4 billion years has such an age. Such a rock probably is much, much older than 6000 years old, but we can't be quite so certain about the rock's age. The situation described here in regard to the dating of a rock is similar to the situation in regard to the scientific dating of the age of the universe. If you were to get an astronomer to explain in detail how we know that the universe is 13 billion years old, he might start on a chain of reasoning involving complex topics such as galactic redshifts and even murkier assumptions such as how much dark matter exists. But there are great uncertainties involved at many points in such a chain of reasoning. Cosmologists like to gloss over these uncertainties, and talk as if everything is “cut and dried,” but it isn't. If I do a Google search for “how do we know hold old the universe is,” the second item in my search results is a wikipedia.org article on “Age of the universe.” I don't see how anyone can read that article and claim it is a coherent explanation of evidence showing the universe is exactly 13 billion years old. The article also notes, “Calculating the age of the Universe is accurate only if the assumptions built into the models being used to estimate it are also accurate.” That's exactly the problem. Our estimates of the age of the universe depend on model assumptions, some of which may be inaccurate. If any of the assumptions are inaccurate, the estimate may be wrong, and possibly very wrong. Moving on to the third in my search results for “how do we know hold old the universe is,” I get a web site for a scientific space probe. That site basically argues: we know the universe is older than 10 billion years old, because globular clusters are at least that old. But the chain of reasoning used to establish the age of globular clusters is also a long and complex chain of reasoning, and there is no way to directly and simply measure the age of such a cluster. 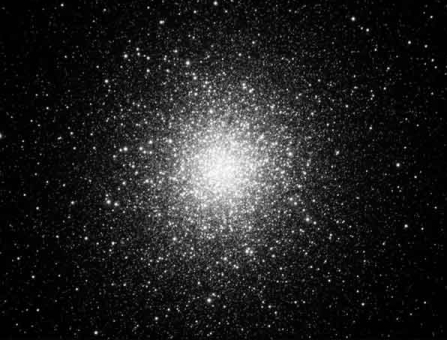 The site notes that some estimates come up with an age for globular clusters as high as 18 billion years old – five billion years older than the estimated age of the universe. In short, there is much, much less certainty here than one would think from reading some cosmologists. When someone such as Siegel refers to a 99.1% accuracy in an age estimate, what he really means is: given the assumptions of my model,there is a 99.1% chance that the universe's age falls within this range. But there may be a 30% chance that one or more such model assumptions may be wrong. So the real uncertainty is much higher. Reason # 2: The universe we observe may have been created much less than billions of years ago, by some power (divine or not) that started it out in a relatively complex state. Let us consider the fact that an omnipotent God could create any type of universe that he wants, including universes other than universes which have that “just created” appearance. An omnipotent God could instantly create from nothing a universe exactly like the universe that existed in 1000 BC or 100 AD or 1000 AD or January 1, 2000. Consider if God wanted to create a universe exactly like the one that existed on midnight Eastern Standard Time at January 1, 2000. God would merely need to will into existence an expanding universe of billions of galaxies, a universe that would include at least one planet with billions of people. God could instantly will into existence those people existing at that date, having them suddenly come into existence with various memories and various states of motion (some walking, some driving, some sleeping, some celebrating the new year in Times Square). Under such a scenario, billions of people would suddenly come into existence, convinced they had lived for years. But they would actually just be recently created. My point is that we cannot be certain that such a thing did not happen any length of time ago-- 100,000 years ago, 10,000 years ago, or perhaps only 10 years ago. The fact that you may have memories of having lived for 20 years does not make it certain that you actually have lived for twenty years. You and everything else in the universe could have been created ten years ago. Now some might argue that it would be deceptive for God to give you memories of some meaningful social experiences you didn't actually have. Even if you grant such debatable reasoning, we are still left with no reason why the universe could not have been created from nothing in the exact state we think the universe had in 3000 BC or 50,000 BC. In fact, we can think of a reason why such a thing might have happened. Perhaps God wanted to “cut to the chase,” as they say, and create a universe immediately filled with interesting life forms, rather than waiting billions of years for such life forms to appear. If you don't like the theistic tone of this reason, there is an alternate version involving no theistic assumptions. It could be that we are just living in a computer simulation, as Nick Bostrom has suggested, perhaps a simulation created by some civilization vastly older than ours. If so, such a simulation may not have been created billions of years ago, but only hundreds of years ago, or thousands of years ago. In such a case, the real age of the universe might not be 13 billion years, but perhaps some vastly smaller number. Reason # 3: There are philosophical reasons why the universe might not be any older than the time when Mind first existed. The standard assumption of scientists is that matter is the father of Mind. The assumption is that first there was only matter for many eons, and that later Mind arose from matter. But there are difficulties in such an assumption. How could Mind (something immaterial you can't touch, see, or directly observe) arise from matter, a totally different type of thing? The concept of Mind arising from matter sometimes seems like the idea of blood oozing out when you squeeze a stone. So it may be we have things mixed up. Rather than matter being the father of Mind, Mind may be the father of matter. It may be that matter did not exist in any real sense until there were minds to perceive that matter. Such an idea can be supported by arguments such as those given by the famous philosopher George Berkeley. Such an idea can also be supported by arguments derived from quantum mechanics, arguments that infer that consciousness is a vital ingredient in the collapse of the wave function, involved when probabilities become actualities. Suppose such a radical assumption is true – that Mind is the father of matter, rather than matter the father of Mind. Then we would have to rethink the age of the universe. Under such a scenario, the age of the universe might be considered the length of time that conscious beings have existed. Such an age might be 100,000 years, or perhaps many millions of years or a few billion years (considering the possibility of extraterrestrial intelligence that may have arisen long ago). The uncertainties here are many. Rather than pretending that we are very wise beings who have figured out the exact age of the universe, we should humbly realize that we are bumbling little newbies who have only just started to put together a few pieces of the vast cosmic jigsaw puzzle. New Findings a Boost for Panspermia Theory? Panspermia is the theory that life on our planet arose from other planets. 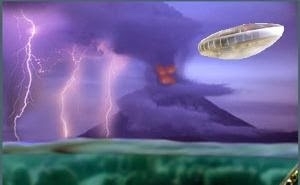 The most plausible variant of the theory is the hypothesis of directed panspermia, the idea that life was seeded on our planet eons ago by some extraterrestrial intelligence, which may or may not have been robotic. Panspermia seems to be a useful concept, because it may help explain something that is otherwise very hard to plausibly explain. The problem with the origin of life is that before you can have anything at all get started from an evolutionary standpoint, a very high level of sophistication has to be reached – in other words, a very high hurdle has to be jumped. This threshold is apparently the simultaneous appearance of a sophisticated genetic code and the existence of self-replicating molecules such as RNA or DNA. There is a severe, unsolved problem of explaining how that happened on the early Earth. How can the panspermia concept help with that? I can help explain it with an analogy. Imagine you robbed $100,000 from a bank, and wanted to explain your new riches to your girlfriend without raising suspicion. If you told her that you just started playing the lottery yesterday, and won $100,000 on your first try, she would never believe you. But if you told her you had been playing the lottery every day for 10 years, and finally won $100,000, she would be much more likely to buy the story. The panspermia concept has pretty much the same effect. We can help “reduce the miracle” of life appearing (making it seem like not quite so much a miracle) if we imagine that there are billions of planets in our galaxy on which life had an opportunity to arise, and that on one of these life did arise, eventually evolving to some form that then spread the seeds of life throughout the galaxy. The more trials or chances there are for an improbable event to occur, the greater the chance of eventual success. Let's look at various possible findings that may increase or decrease the plausibility of the panspermia idea. Below are some things that may add to the credibility of the panspermia theory. The existence of abundant planets revolving around other stars. The more planets that exist in our galaxy, the more attractive the idea of panspermia is, because the more it accomplishes the effect of reducing an origin of life “miracle” by increasing the number of trials or chances. The existence of planets much older than Earth. If there are planets in our galaxy billions of years older than Earth, than panspermia becomes a more attractive theory, because if allows us to say that even if life did not have enough time to naturally arise on Earth four billion years ago, it might have arisen on other planets during a much larger time window spanning billions of years, and then spread to our planet. Also, the earlier that life arose in our galaxy, the more likely that it may have spread to other solar systems. Possible breakthroughs allowing interstellar travel. 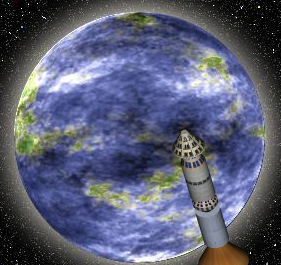 If interstellar travel is impossible, then panspermia is ruled out. But if there are breakthroughs that allow interstellar travel, then the idea of panspermia becomes more popular. Evidence of artificiality in the genetic code. In this paper, some scientists have claimed to find evidence of artificial features in the genetic code. If such claims are ever confirmed, they would give weight to the hypothesis of panspermia (although others might argue that some divine hand was involved). Below are some possible developments that might decrease the credibility of the panspermia theory, making it less likely to be true. The artificial re-creation of self-replicating molecules in conditions simulating the early Earth. Imagine if scientists were ever to rig up some laboratory setup that mimicked the conditions of our planet four billion years ago. If the scientists were ever able to produce self-replicating molecules such as RNA in such a laboratory setting, that would help show that the origin of life wasn't such an improbable miracle. There would then be much less need for any theory of panspermia. The artificial re-creation of the genetic code in conditions simulating the early Earth. Again, imagine if scientists were ever to rig up some laboratory setup that mimicked the conditions of our planet four billion years ago. If the scientists were ever able to produce something like the genetic code in such a laboratory setting, that would help show that the origin of life wasn't such an improbable miracle. There would then be much less need for any theory of panspermia. Below are some possible developments that would not clearly either lend credibility to the panspermia theory, or make it seem less plausible. The discovery of life on a planet revolving around another star. Imagine if scientists were to find the tell-tale chemical signature of life in some planet revolving around another star. No doubt some would claim that this was proof that life will naturally arise wherever it gets the chance, and that there is therefore no need for a theory of panspermia. But such logic would be incorrect. We would have no idea of whether that life discovered on that distant planet had naturally arisen on that planet, or had been seeded on that planet through the same process imagined by the panspermia theory. The discovery of life elsewhere in our solar system. Imagine if scientists were to discover life on one of the moons of Jupiter, or in a comet in our solar system. No doubt some would claim that this was proof that life will naturally arise wherever it gets the chance, and that there is therefore no need for a theory of panspermia. But such logic would be incorrect. We have no idea how panspermia might have worked if it occurred billions of years ago. Rather than it involving only a placement of life on our planet, it might have involved a biological seeding of large parts of our solar system, including a large part of our planet's cometary system. How is the Panspermia Theory Standing Up These Days? So far, the panspermia theory seems to be holding up quite well. Little has come in recent decades from scientists' attempt to recreate the key components of life in a laboratory setting. When science writers write about such a thing, they usually discuss the Miller experiments, but those experiments occurred way back in the 1950's, and didn't take things very far, producing only some of the building blocks of proteins rather than self-replicating molecules. Attempts to get much farther haven't been very successful. The origin of the genetic code and the first self-replicating molecules is still a gigantic mystery, a mystery that panspermia theorists hope to lessen. In the past ten years astronomers have discovered more than 1000 extrasolar planets, leading them to conclude there are many millions or billions of planets in our galaxy on which life can evolve. Last week astronomers announced the discovery of five earth-sized planets in a solar system (Kepler-444) that is 11.2 billion years old, almost 7 billion years older than our solar system. That's exactly the type of finding that lends weight to the idea of panspermia. If there were billions of planets for life to evolve five billion years before Earth even existed, that increases the chance that life may have been spreading throughout the galaxy while our solar system was forming; and in such a case some of that life may be the parent of all earthly life. But it is an open question whether the theory of panspermia eliminates the miracle of the origin of life, or simply makes it seem somewhat less miraculous. There may be some possibilities that still deserve to be called miraculous even if you allow a billion trials and 10 billion years for their occurrence.